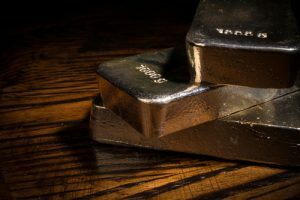 Precious metals futures kicked off the new trading week and month on Monday with gains ranging from 0.2% for gold to 1.1% for platinum. Silver rallied to a two-year high while gold ended at an almost one-month high. Gold for December delivery rose $2.10 to settle at $1,359.60 an ounce on the Comex division of the New York Mercantile Exchange. The close is the highest since July 7 when the yellow metal ended at $1,362.10 an ounce. "Gold needs to break through $1,380 to race higher, but silver is moving 5+ % when gold is moving 1.4%," MarketWatch quoted Julian Phillips, founder and contributor to GoldForecaster.com. Gold futures traded from a low of $1,353.20 to a high of $1,361.90. They climbed 2.6% last week, gaining 2.8% in July. Silver for September delivery tacked on 15.3 cents, or 0.8%, to close at $20.50 an ounce. The settlement is the highest since July 30, 2014 when prices ended at $20.60 an ounce. Silver futures ranged from $20.33 to $20.70. They advanced 3.3% last week and logged a monthly increase of 9.3%. With their gains on Monday, they are 48.5% higher on the year to date. October platinum settled up $12.70 to $1,163.30 an ounce, trading between $1,149.70 and $1,168. Palladium for September delivery tacked on $6.50, or 0.9%, to $716.25 an ounce, ranging from $706 to $724.55. Gold added $7.65, or 0.6%, to $1,349.65 an ounce. Silver jumped 52 cents, or 2.6%, to $20.51 an ounce. United States Mint bullion sales were unchanged Monday, following weaker levels in July. Below is a sales breakdown of U.S. Mint bullion products with columns listing the number of bullion coins sold during varying periods of time. Products with an asterisk (*) are no longer available. The Mint’s 13 worldwide bullion coin Authorized Purchasers didn’t order any Harpers Ferry 5-ounce silver ATB bullion coins for the past 1.5 months, even though the Mint sent them a reminder that they are still available & a new one will not be issued till August 29. The 34,200 coins they purchased in the first 2 weeks of June must have met demand of collectors & investors. Sept. 8 2016-W gold Standing Liberty quarter Uncirculated coin. Sept. 16 2016-W ASE Proof 30th anniversary edge lettered coin.